Kinetic Tee – meet our athlete model! One of my favourite parts of the pattern development process is deciding who our athlete model will be. I absolutely loving selecting people who not only show off my designs in the best way possible, but also hopefully inspire you all, too. I've always used real athletes instead of professional models, and these are folks with day jobs, dreams, dramas, and goals just like you and me. I always get a little nervous asking if they'll model for me, but I've yet to have anyone refuse, so I'm not sure why I feel that way!! One of my favourite parts of the pattern development process is deciding who our athlete model will be. I absolutely loving selecting people who not only show off my designs in the best way possible, but also hopefully inspire you all, too. I’ve always used real athletes instead of professional models, and these are folks with day jobs, dreams, dramas, and goals just like you and me. I always get a little nervous asking if they’ll model for me, but I’ve yet to have anyone refuse, so I’m not sure why I feel that way!! 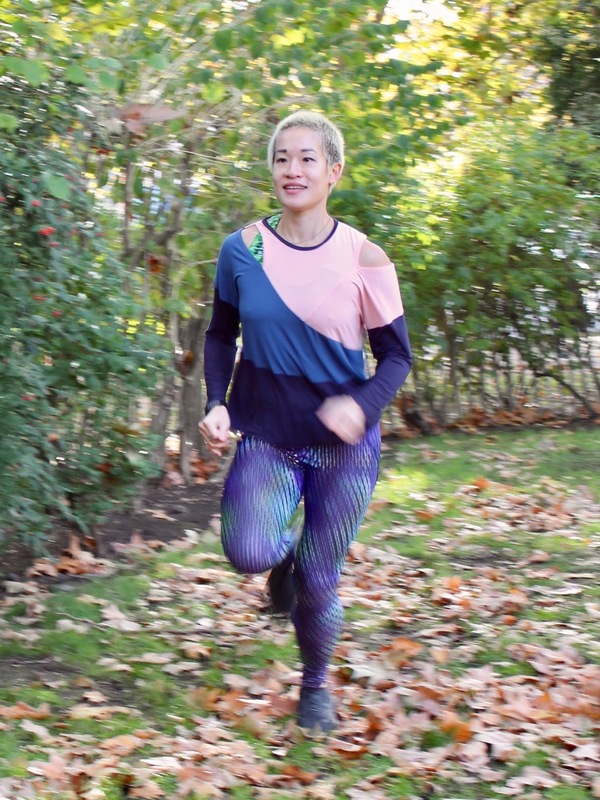 But I was chuffed when Cynthia happily agreed to be the athlete model for our new Kinetic Tee pattern – I first met her a few years ago at Run dem Crew, and for a while we ran together before she became much faster than me! She’s gone off and run marathons, trained hard on the track, and concentrated on triathlons, even running a few half ironmans (70.3! ), which just blows my mind. And I run marathons! And when I say she’s fast, I mean it – girl came in THIRD overall and FIRST female at the London tri this year. And that’s no small race! So right now you might be sitting there thinking “Wow, that’s so impressive, but I can’t see myself doing a triathlon, she must be built of tougher stuff!”. But let me tell you – Cynthia is also one of us! She is a crazy good knitter, folks! 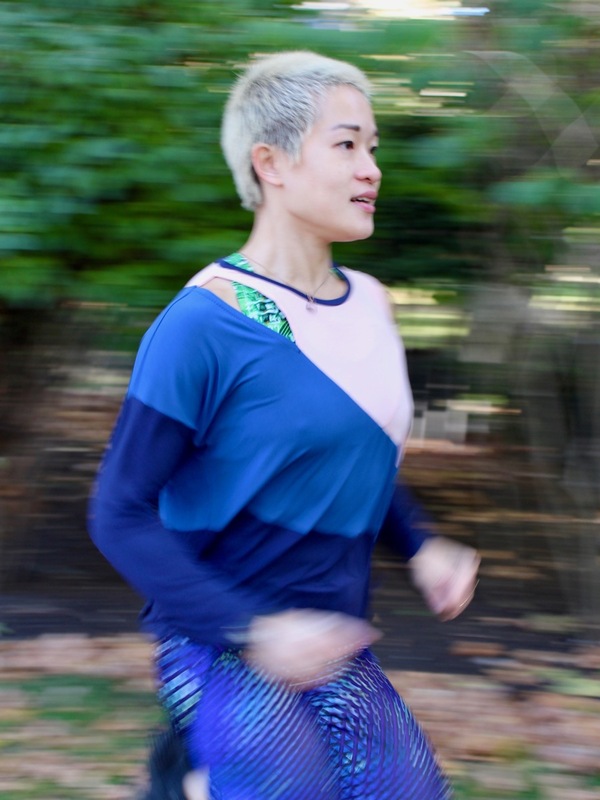 So you can see why I was so excited to have Cynthia as our Kinetic Tee pattern covergirl, and beyond all of the above, she’s got a wicked sense of humour, too. We had to take her photos quite early as she was going to Hong Kong for a few weeks’ visit and between taking the photos and launching the pattern, she got engaged, too! So I hope you’ll join me in wishing her and her fiance all the best! Remember, you can treat yourself to a hefty 20% off all our sewing patterns by using the code KINETICFUN at shop.fehrtrade.com til 29 November. Paypal users, take note that you must go quite far through the checkout process before the discount box appears. Separator image Posted in Gallery, Inspiration and tagged with fehr-trade-patterns, kinetic-tee, knit, top. Great pattern and good luck to Cynthia in all her endeavors! Love the pattern. I own all your patterns. Best wishes to Cynthia!! Her accomplishes…just wow! !